The week it hit the stores, Weirdos from Another Planet! touched down at No. 1 on Walden's and B. Dalton's bestseller lists and No. 2 on the New York Times bestseller list. How do you top such success? 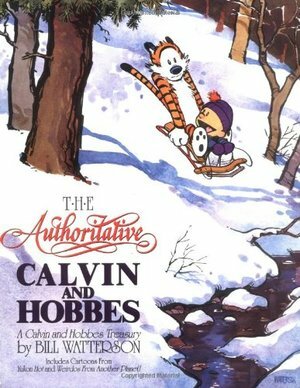 With The Authoritative Calvin and Hobbes, a large-format treasury of the cartoons from Yukon Ho! and Weirdos from Another Planet! (including full-color Sunday cartoons) plus a full-color original story unique to this collection. Its reservation on the top of the national bestseller lists is already confirmed! Millions of readers have responded ot the tremendous talent of Bill Watterson. His skill as both artist and writer brings to life a boy, his tiger, and the imagination and memories of his ardent readers. After five years of syndication and six bestselling collections, The Authoritative Calvin and Hobbes picks up where The Essential Calvin and Hobbes left off - bringing more of the irresistible antics of Calvin and his magical sidekick Hobbes to millions of eager fans around the globe. As the strip's phenomenal success witnesses, Bill Watterson's Calvin and Hobbes is the authority on humor. Reminded me of why I love Calvin and Hobbes so much. It does make me a little sad, though, that we never get to see Calvin get older.